LOS ANGELES – Saying the decisions we make for our children today will impact all of us tomorrow, First 5 LA announced today its 2017 State Legislative Agenda which supports long-term public policy change to improve the well-being of the 650,000 children aged 0-5 and their families who reside in Los Angeles County, a third of all young kids in California. First 5 LA’s 2017 State Legislative Agenda addresses several issues facing children and their families, including access to subsidized early care and education programs regardless of changes to family income (AB 60 by Assemblymember Miguel Santiago and Assemblywoman Lorena Gonzalez), child care program expulsion alternatives (AB 752 by Assemblywoman Blanca Rubio) and funding for early care and education access for foster children (AB 1164 by Assemblymember Tony Thurmond). First 5 LA’s support of legislation includes advocacy activities such as letters of support to lawmakers, testimony at legislative hearings and meeting with legislators and their staff, bill sponsors and advocacy partners. First 5 LA also works with stakeholders to educate the general public and elected officials about the importance of these items to the health, well-being and early care and education of children prenatal to age 5, their parents and caregivers. Each year, First 5 LA’s Board of Commissioners votes to support state bills and federal items that reflect the agency's policy goals, including early care and education, family supports and health care systems. First 5 LA’s position on legislation is informed by internal staff and partners in the field, including the Intergovernmental and External Affairs Branch of the L.A. County’s CEO Office. First 5 LA’s engagement in legislative advocacy is guided by criteria endorsed by the Board, including opportunities to advance First 5 LA strategic plan priorities, opportunities that provide sustainability for First 5 LA's legacy investments, such as oral health and housing, policies that directly impact First 5 LA including revenues, and First 5 LA’s potential to influence policy and the impact of our engagement in policy issues as a public entity. First 5 LA’s 2017 State Legislative Agenda approved by its Board is below. 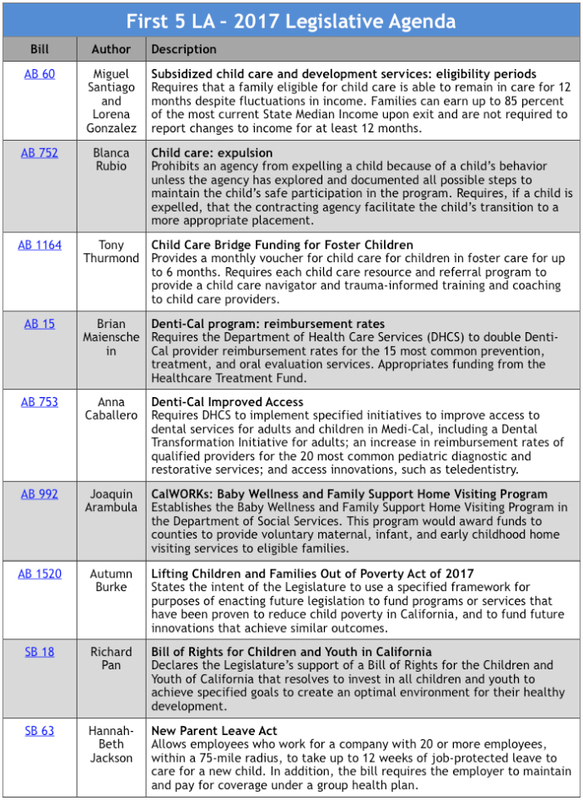 The full list, which includes supported measures and other bills of interest to First 5 LA being tracked, can be found here. Requires that a family eligible for child care is able to remain in care for 12 months despite fluctuations in income. Families can earn up to 85 percent of the most current State Median Income upon exit and are not required to report changes to income for at least 12 months. Prohibits an agency from expelling a child because of a child’s behavior unless the agency has explored and documented all possible steps to maintain the child’s safe participation in the program. Requires, if a child is expelled, that the contracting agency facilitate the child’s transition to a more appropriate placement. Provides a monthly voucher for child care for children in foster care for up to 6 months. Requires each child care resource and referral program to provide a child care navigator and trauma-informed training and coaching to child care providers. Requires the Department of Health Care Services (DHCS) to double Denti-Cal provider reimbursement rates for the 15 most common prevention, treatment, and oral evaluation services. Appropriates funding from the Healthcare Treatment Fund. Requires DHCS to implement specified initiatives to improve access to dental services for adults and children in Medi-Cal, including a Dental Transformation Initiative for adults; an increase in reimbursement rates of qualified providers for the 20 most common pediatric diagnostic and restorative services; and access innovations, such as teledentistry. Establishes the Baby Wellness and Family Support Home Visiting Program in the Department of Social Services. This program would award funds to counties to provide voluntary maternal, infant, and early childhood home visiting services to eligible families. States the intent of the Legislature to use a specified framework for purposes of enacting future legislation to fund programs or services that have been proven to reduce child poverty in California, and to fund future innovations that achieve similar outcomes. Declares the Legislature’s support of a Bill of Rights for the Children and Youth of California that resolves to invest in all children and youth to achieve specified goals to create an optimal environment for their healthy development. Allows employees who work for a company with 20 or more employees, within a 75-mile radius, to take up to 12 weeks of job-protected leave to care for a new child. In addition, the bill requires the employer to maintain and pay for coverage under a group health plan.